I am one of these people that like to know what things were before the main historical event that took place there occurred. Before it served as the main building for Polish Soldiers (Evacuated from the USSR) located in a nearby field in tents, it was the brewery in Auchtertool, Fife. It's history is rather interesting! Where was the former Auchtertool brewery? It's current address is (rather aptly! ): The Maltings, Auchtertool, Kirkcaldy KY2, currently the site of 4 bungalows. Auchtertool Brewery once had an exceptional Porter, it was established in 1650 (coincidentally around the time Sir Andrew Wood was building the tower at Largo estate in Upper Largo). It must have been a decent enough brewery originally because the word was: "The village is famed for its extensive brewery, making ales, porter and table beer. The ales are shipped at Kirkcaldy for London" - from A descriptive & historic gazetteer of the counties of Fife, Kinross & Clackmannan by M Barbieri, published 1857. Local poets too wrote verse about Auchtertool brewery and all over Fife the ales, porters and beers were drunk. 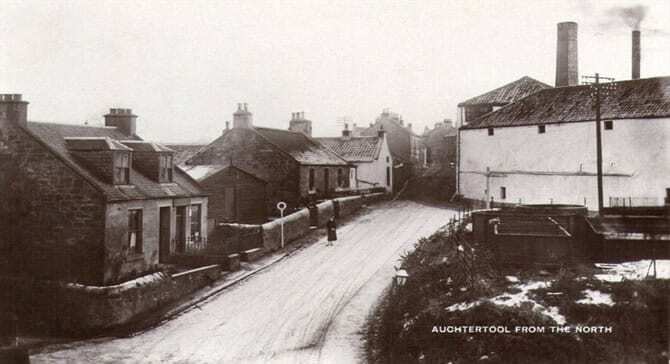 In 1845 the Auchtertool brewery was re-modelled into Auchtertool distillery (Licensee: James Liddell & Co) with distillation starting in 1851 and continuing until 1868 when the distillery was dormatised. Later that year, Walter Bartholomew restarted production. In 1896 Robertson, Sanderson & Co bought the Auchtertool Disdtillery and then, in turn, sold it to Distillers Company Ltd in 1923. 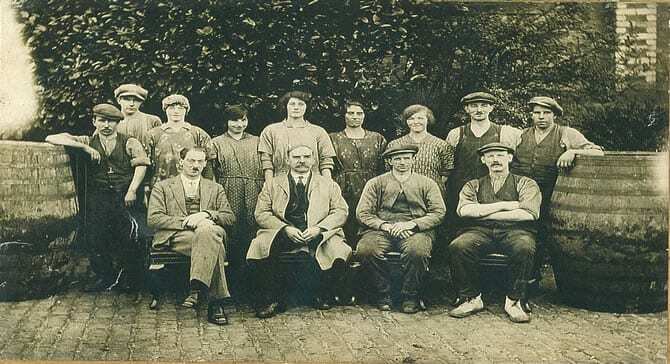 In 1927 the Auchtertool whisky distillery was closed for good by Distillers Company Ltd, it's last reported output being 86,000 gallons per year. 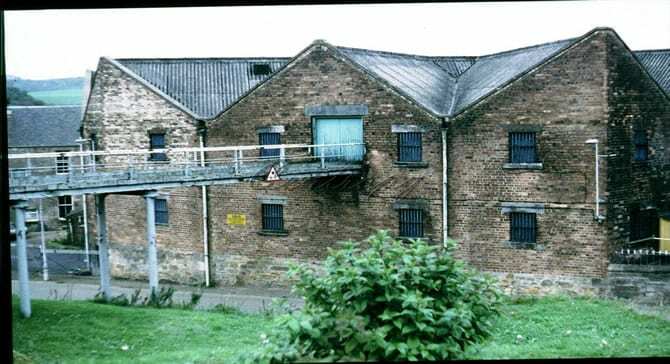 The building then became Auchtertool maltings and warehouses, with malt being produced for other distilleries and whisky from other distilleries being matured in their sheds. Both the maltings and the maturing sheds were operated by Distillers Company Ltd until 1973. In the photo below we are looking east onto the Auchtertool maltings. The first 3 buildings are the warehouses with the maltings being located towards the rear. We understand that these buildings are where the Polish troops went for meals. The 2 pagodas that are visible are part of the kiln ventilators. A local gave me this photo of workings at the maltings. If you look at the cobbles and also the brick detailing, compare this to the "Roll Call" photo on our other page on Auchtertool. When the Polish soldiers were at Auchtertool brewery it was not a "brewery" as some of their accounts claim but rather a "maltings" with associated warehouses (and to be completely pedantic at that point it was a former distillery and not former brewery!). 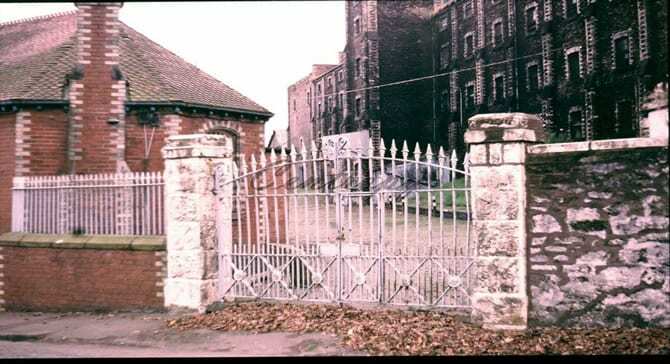 We know from various accounts that the Polish Government In Exile had requisitioned the former Auchtertool maltings for the purposes of using it as a canteen to feed their troops as accounts mention that food for the soldiers was served there. This would seem likely enough as it was just up the road from the distribution camp that was stationed in a field 10 minutes away. Also, when you look at the buildings of the old maltings, there were many long sheds, one can only imagine some long makeshift tables being constructed for the troops to sit down in large groups and eat together. Eventually, the majority of Auchtertool maltings was demolished, although the manager's house is still there, right beside the site (across the road). A row of single storey bungalows would soon replace it with one last building from the maltings remaining as a dwelling house as a last reminder to the past.